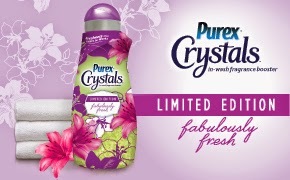 I recently received a bottle of Purex Crystals to try out complimentary from Purex. New Purex Cystals Limited Edition Fabulously Fresh is the latest Purex brand laundry enhancer bringing a fresh sensation to your laundry experience. This limited edition bottle and scent will add a colorful escape to your laundry day. The fresh scent of this natural fabric softener lasts for weeks, not just days - to eliminate odor and freshen laundry. It will not reduce the absorbency of towels, and is safe for all loads of laundry (including children's sleepwear and athletic wear). I found this scent to be amazing, and not overpowering. I'm honestly a little sad that it's just a limited edition, I would not be disappointed if they decide to keep it in stores long term. This was my first experience with Purex Crystals, and once I figured out how to use them (by adding them to your wash cycle, not the rinse cycle like I initially assumed) they were a wonderful and welcomed addition to my laundry routine. You can enter to win a coupon good for one free bottle of the exact product I received on the Giveaway Tools form below. One lucky reader within the United States (age 18+) will receive a coupon in the mail. Giveaway open through 4/20/2014. Disclaimer: Baby and the Chi's blog received the product(s) mentioned in this post for the purpose of review and evaluation. No monetary compensation was received. All opinions expressed in this post are 100% my own. This post may contain affiliate links. The blog not responsible for prize delivery. 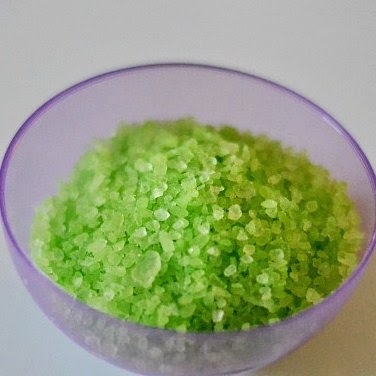 I love the different scents of pure crystals. I like that they actually work. I would love to try. I really like Purex products. I like that it can give the fabrics a nice freshly washed smell! I would love to try these because we have really hard water and it takes something strong to keep our clothes smelling good. Limited edition......really guys? Now that I like the scents u want to limit me? I had used them in the past, once then got hooked on another brand. I really want to try this limited edition as I have heard a lot of postives about it. Thanks. I have not used these yet. I have heard lots if great things though! These are fantastic! The scent lasts forever so that when you open you linen closet or closet, the scents just come out and greet you pleasantly! I'm a big fan of Purex products, but I havent seen these in our store...hmmm...I might have to check target. I'd love to try them though! Does this scent smell fruity or floral-y?